The Last Quarter Moon is Saturday January 2. Earth is at perihelion. 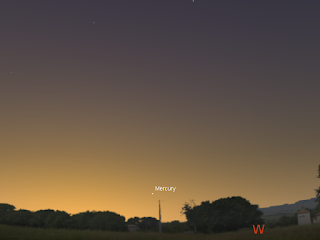 Mercury is low in the twilight sky. 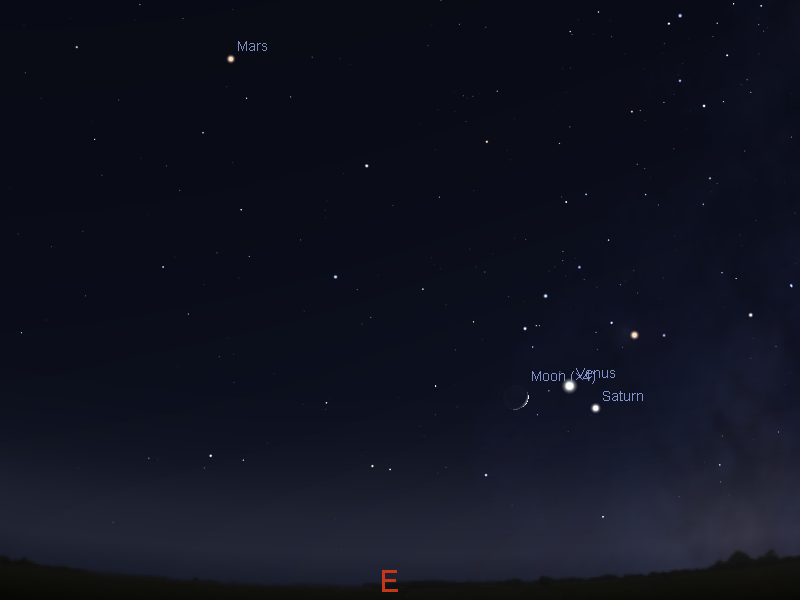 Jupiter, Mars, Venus and Saturn form a line in the morning sky and are joined by the waning to crescent Moon. Venus and Saturn come closer. On the 7th Venus, Saturn and the crescent Moon form a triangle. Comet C/2013 US10 Catalina is higher in the morning sky and comes close to the bright star Arcturus. The Last Quarter Moon is Saturday January 2. The Moon is at apogee, when it is furthest from the Earth, at this time. Earth is at Perihelion on the 3rd, when it is closest to the Sun. Evening sky on Saturday January 2 looking east as seen from Adelaide at 21:00 ACDST. Mercury is just above the horizon in the twilight. Similar views will be seen elsewhere in Australia at the equivalent local time. (click to embiggen). Mercury falls back into the twilight. This will be the last week it is reasonably visible in the evening. 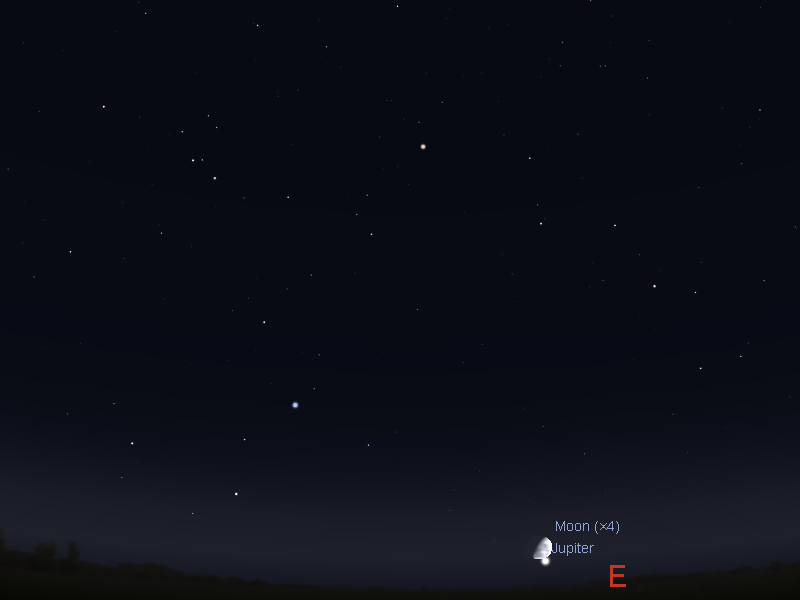 Jupiter enters the evening sky around midnight daylight saving time later this week. On the morning of New Years Day, if you are up celebrating, you will see Jupiter and the waning Moon rise shortly before (non-daylight saving) or shortly after (daylight saving) midnight. 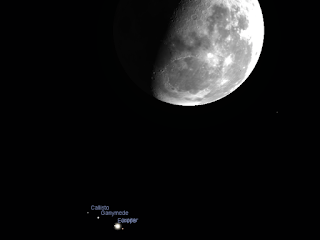 If you have bought binoculars or a low powered telescope to the New Years celebration you can see both the Moon and Jupiter's moons (along with Jupiter) in the binocular or telescope field of view on New Years morning. Jupiter and the Moon will be at their closest a couple of hours after midnight, so if you have a long celebration it is well worth watching the pair during the proceedings. Telescopic view of the Moon and Jupiter, simulating the view through a 25 mm eyepiece on a 4" Newtonian Reflector at 2:30 pm daylight saving time. After New Years the Moon visits the rest of the planets (see below). 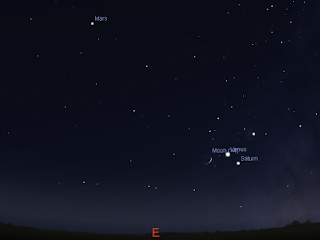 Early morning sky on Thursday January 7 looking east as seen from Adelaide at 5:00 ACDST showing Mars, Venus, Saturn and the crescent Moon with the red star Antares close by. Similar views will be seen elsewhere in Australia at the equivalent local time. (click to embiggen). During the week Venus enters the head of the Scorpion and continues to close in on Saturn. Venus, Saturn and the red star Antares form a triangle low in the early twilight. On the mornings of January 4th Mars and crescent Moon are close, on the 7th, Venus Saturn and crescent Moon are close and on the morning of the 9th, Venus and Saturn spectacularly close (also visible together in a low power telescope). Comet C/2013 US10 is a telescope only object, and still difficult from the southern hemisphere. On the 1st and 2nd the comet is very close to the bight star Arcturus, making it easier to find in small scopes. From the northern hemisphere it is looking quite good in telescopes.